SIR – Lord Bramall notes, rightly, that the authorities should not “cast aside the basic principles of justice itself” when investigating cases of child abuse. Next Wednesday, a group of individuals concerned with obtaining justice in the case of the late George Bell, former bishop of Chichester, will hand in a petition with over 2,000 signatures at Lambeth Palace. It is a year since the Church of England published the outcome of a covert inquiry into a single case of alleged child abuse by the bishop in the late Forties or early Fifties. No effort was made to assemble, or to request that those in a position to do so might assemble, a case for the defence. Moreover, the Church has refused numerous requests to disclose the nature of the sources it used to reach its decision. The petition requests that the case should be reopened. In light of the fact that a strong case for the late bishop’s defence has now been assembled by a number of people with close connections to him, there is no excuse for the Church to delay a fresh investigation any further. 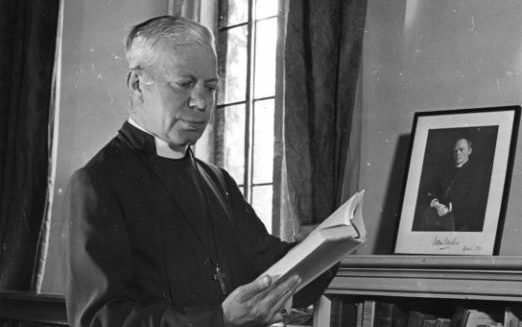 SIR – As the daughter of Franz Hildebrandt, a close friend of Bishop George Bell, who made him and so many other refugees welcome in this country, I am deeply saddened by the recent accusations against the bishop. However, like Charles Moore, I am even more saddened by the Church’s apparent willingness to ignore the basic principle of British justice: that a person is innocent until proved guilty. It would appear that the primary motivation in the Church’s decision to compensate the alleged victim and disgrace Bishop Bell was fear of public outcry had it not done so. Even if there were sufficient evidence to warrant Bishop Bell’s arrest had he been alive, which has certainly not been demonstrated to date, this is a far cry from saying he would have been charged or found guilty. As Mr Moore notes, there have been many cases of alleged abuse in which people have been unfairly treated by the authorities and the media, and later shown to be innocent. The term “witch hunt” has already been used with regard to the recent treatment of Bishop Bell. It is ironic that the Church could be seen to be a party to such a process – which ceased in this country in the literal sense several centuries ago. I challenge the Church authorities to make public the evidence on which their actions have been based, and to give us the opportunity of examining the facts for ourselves. SIR – Charles Moore identifies the bewilderment and anguish that exist in the diocese of Chichester, and well beyond it, following the announcement of an allegation against Bishop George Bell and the settlement of a civil claim. This goes deep. It has inevitably been linked with the trial and conviction of other clergy from the diocese of Chichester who have been convicted of sexual abuse, among them Peter Ball, a former bishop of Lewes. However, the impact of an accusation against a person of Bishop Bell’s stature is far more profound. We have not lost sight of that. The suggestion that we would trade the reputation of Bishop Bell for a moment of political, social or even media advantage is seriously mistaken. The perspective that receives little acknowledgement in Mr Moore’s article is that of a survivor. Within Britain, and certainly within the Church of England, we are seeking to move on from a culture in which manipulation of power meant that victims were too afraid to make allegations, or allegations were easily dismissed. In future we must provide safeguards of truth and justice for all, victim and accused alike. It is for that reason that I welcome the Goddard Inquiry as a more balanced forum than the media might be for a judicial and forensic assessment of our handling of child-abuse cases. If, in the matter of Bishop Bell, or any other case, we in the diocese of Chichester are shown to have acted without proper attention to our responsibilities as guardians of the Christian faith, the vulnerable and the voiceless, then I would expect public censure and its consequences to follow. This entry was posted in Justice and tagged Bishop George Bell, Charles Moore, Church of England, Daily Telegraph, Diocese of Chichester, Dr Ruth Hildebrandt Grayson, Lambeth Palace, Lord Bramall, Rt Rev Martin Warner Bishop of Chichester on October 15, 2016 by richardwsymonds37.